The FBI is investigating whether there is classified information in new emails uncovered during the sexting investigation of disgraced former congressman Anthony Weiner, the estranged husband of one of Hillary Clinton's closest aides. FBI Director James Comey told Congress in a letter that the emails prompted investigators to take another look at whether classified information had been mishandled, which had been the focus of its recently closed, criminal probe into Clinton's use of a private email server. Comey couldn't guarantee that the latest focus of the investigation would be finished before Election Day. Clinton said Friday that "the American people deserve to get the full and complete facts immediately. She urged the FBI to "explain this issue in question, whatever it is, without any delay." "Let's get it out," she said. The FBI lifted a major legal threat to Hillary Clinton's presidential campaign Tuesday, recommending no criminal charges for her handling of highly classified material in a private email account. But Director James Comey's scathing criticism of her "extremely careless" behavior revitalized Republican attacks and guaranteed the issue will continue to dog her. Andrew Siff reports. 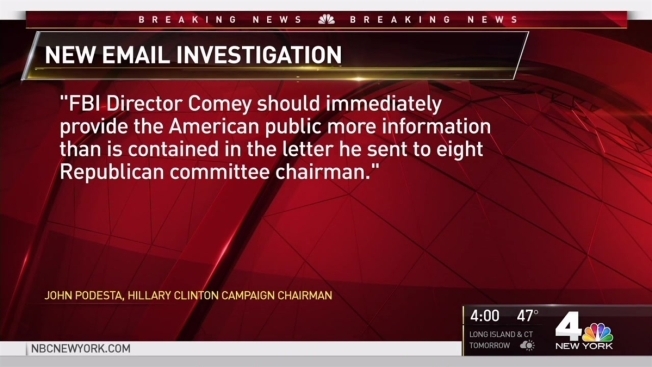 Comey did not provide details about the emails, but officials tell NBC News that the emails emerged through the FBI's separate sexting probe of Weiner, who is separated from Clinton confidant Huma Abedin. She served as deputy chief of staff at the State Department and is still a key player in Clinton's presidential campaign. The two separated earlier this year after Weiner was caught in 2011, 2013 and again in 2016 sending sexually explicit text messages and photographs of himself undressed to numerous women. Federal authorities in New York and North Carolina are investigating online communications between Weiner and a 15-year-old girl. The U.S. official was familiar with the investigation but was not authorized to discuss the matter by name and spoke on condition of anonymity. The disclosure came less than two weeks before the presidential election and thrust a political liability for Clinton back into the headlines that her campaign thought had been resolved and had begun to recede from the minds of voters. 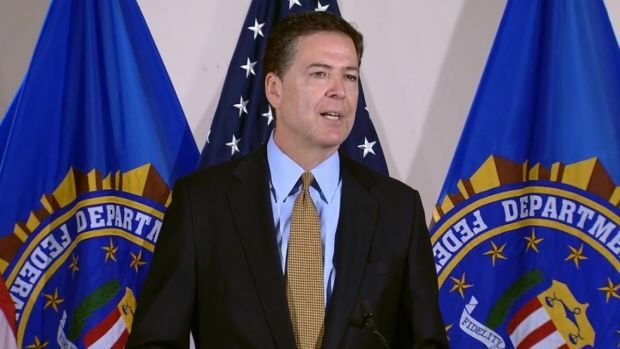 The FBI said in July its investigation of Hillary Clinton's private email server was finished. Comey stressed in his letter that the FBI could not yet assess "whether or not this material may be significant," or how long it might take to run down the new investigative leads. "In connection with an unrelated case, the FBI has learned of the existence of emails that appear to be pertinent to the investigation," Comey wrote. "I agreed that the FBI should take appropriate investigative steps designed to allow investigators to review these emails to determine whether they contain classified information, as well as to assess their importance to our investigation." Clinton, in a brief statement to reporters Friday evening, noted: "The director himself has said he doesn't know whether the emails referenced in his letter are significant or not. I'm confident whatever they are will not change the conclusion reached in July." It was unclear what the emails contained, who sent them, or what connection they might have to the yearlong investigation the FBI closed in July without recommending criminal charges. The FBI probe focused on whether Clinton sent or received classified information using a server in the basement of her New York home, which was not authorized to handle such messages. Abedin was interviewed by the FBI as part of its investigation. Comey said in July that his agents didn't find evidence to support a criminal prosecution or direct evidence that Clinton's private server was hacked. Matthew Miller, a former chief spokesman for the Justice Department, was dismayed by the timing of Comey's letter. "Longstanding DOJ and FBI practice is you don't say anything publicly close to an election that can possibly influence that election," Miller said. Comey, who has talked often about the FBI's need to be accountable to the public, promised extraordinary transparency about the investigation and during intervening months has authorized the release of investigative files from the case, which are normally kept confidential. That stance also left Comey, a career federal prosecutor who has served under both Republican and Democratic administrations, open to criticism from leaders in both parties that he was trying to influence the outcome of the presidential race. FBI Director James Comey says an investigation into Hillary Clinton's use of private email servers determined the former secretary of state was careless with classified information, but said no reasonable prosecutor would bring criminal charges in the case. As such, he said his agency would not recommend to the Department of Justice that criminal charges be brought. Clinton campaign supporters were already suggesting the FBI director was putting a thumb on the scale. Had he waited until after Nov. 8 to announce the discovery of the new emails, however, Comey would surely have faced criticism for sitting on major news until after the new president had been selected. In an internal email to FBI employees, Comey wrote: "Of course, we don't ordinarily tell Congress about ongoing investigations, but here I feel an obligation to do so given that I testified repeatedly in recent months that our investigation was completed. I also think it would be misleading to the American people were we not to supplement the record." The Associated Press acquired the email Friday night. State Department spokesman Mark Toner said the department learned about the FBI letter from news reports and did not get any notification from the FBI. Toner pledged the department would "cooperate to the full extent that we can." Speaking at a Clinton rally in Florida, President Barack Obama also steered clear of the issue. White House spokesman Eric Schultz declined comment beyond reiterating Obama's continuing support for Clinton. The ranking Democrat on the Senate Intelligence Committee, Sen. Dianne Feinstein, said Comey's letter was particularly troubling because it left so many questions unanswered. "Without knowing how many emails are involved, who wrote them, when they were written or their subject matter, it's impossible to make any informed judgment on this development," said Feinstein, D-Calif. "The FBI has a history of extreme caution near Election Day so as not to influence the results. Today's break from that tradition is appalling." 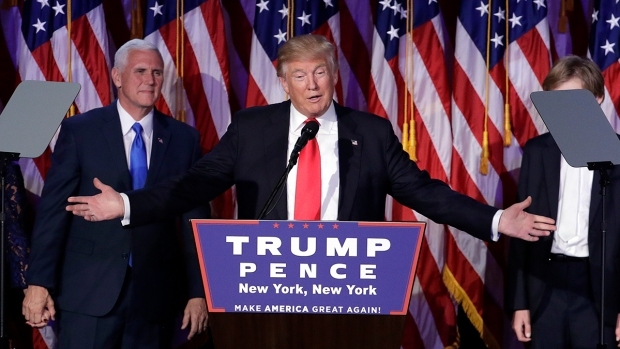 Republicans immediately pounced on the news, hoping to shake up a presidential race where most polls appear to show Republican nominee Donald Trump lagging well behind Clinton. House Speaker Paul Ryan said Clinton has "nobody but herself to blame." "She was entrusted with some of our nation's most important secrets, and she betrayed that trust by carelessly mishandling highly classified information," Ryan, R-Wis., said in a statement. "This decision, long overdue, is the result of her reckless use of a private email server, and her refusal to be forthcoming with federal investigators. I renew my call for the Director of National Intelligence to suspend all classified briefings for Secretary Clinton until this matter is fully resolved." Speaking to cheering supporters at a rally in New Hampshire, Trump used Comey's new letter to attack Clinton. "We must not let her take her criminal scheme into the Oval Office," said Trump, who has pledged to "lock up" his political rival if elected. "Perhaps finally justice will be done." Prior to seeking public office as a Republican, Trump was a supporter of Clinton's past campaigns for president and senator. Records show the New York billionaire also contributed at least $4,300 to former Rep. Weiner's Democratic campaigns.